PLEASE FULLVIEW! IT LOOKS MUCH BETTER THAT WAY! My first InuYasha wallie. I think it came out pretty cute, but it will probably be removed 'cuz that's just my luck -.-; It took me a while to find textures & the right soft colors that would fit well with the image, but I think it paid off. Adding paperclips was fun too! It was mostly just to make it seem more realistic. This wallie is also available at The Otaku & AnimePaper. So cute! The bg work is really nice, and so are the flowers. The paper clips are good and a nice touch. But, I really like the image that you used. I've not seen this one before, so I really like it. Nice work! It's really good n it"s So Cute! realy cute, but who are they? 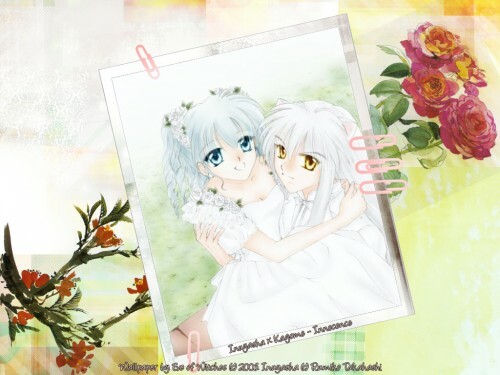 although i dont like kagome this is adorible.